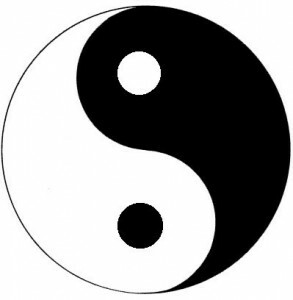 Yang & Yin encompass the beautiful duality of all life and matter. One cannot exist without the other. Would happiness exist without suffering? What is the Yin-Yang Theory? I am of course not talking about the Yin-Yang twins here. Instead I am referring to the ancient Taoist (pronounced dao-ist) theory of everything, and I mean everything. Yin and Yang (pronounce yong) are opposite forces that unify to dictate anything from the universe all the way down to sub atomic particles–all life and matter as we know it. Everything contains yin and yang. They are opposites, yet complementary and depend on one another. It is not possible to have something that is purely yang or purely yin. For example, night is the opposite of day but the existence of night would not be possible without day. Together night and day form our concept of a calendar-day (24 hours). In more known terms, the Bible expresses a similar idea in the phrase, “I am the Lord; I do not change.” (Malachi 3:6) . In essence, the source of yin and yang is God, the One, the energy that connects and resides within all matter, or any other similar source that follows your beliefs. The Yin-Yang symbol represents two fish. First, it is important to know that yin is black and yang is white. The black Yin fish has a white (yang) eye. Similarly, the white Yang fish, has a black (yang) eye. Symbolically, this translates to the idea that nothing is purely yin and nothing is purely yang. This symbol is overall meant to depict the dynamic relationship between yin and yang. They are always changing but always constitute a whole (circle). Before I go off listing different examples of yin and yang, please remember that nothing is purely yin or yang. If this is forgotten, the idea can become quite confusing. If something is commonly identified as Yin, for example, you can almost always dissect its contents to find both Yin and Yang features. When something is classified as Yin or Yang, it refers to the predominating class and the concept at face value (there is no consideration of the inner workings with strict classifications). Keeping this in mind will really help you understand the examples provided. When the balance of yin and yang becomes one-sided, the system transforms into its opposite. Extreme activity (yang) requires rest (yin). Excessive consumption of caffeine or sugar (yang) can result in an energy crash. High blood pressure (yang) can result in a stroke causing paralysis or death (yin). Excessive cold (yin) that causes frostbite can actually have a hot and burning (yang) sensation. Whenever a system or phenomena becomes too favored to one side, there is an action to counterbalance it. In seeking health, it should be your goal to prevent yin or yang from having to balance themselves. In extreme cases of imbalance when yin or yang are forced to balanced themselves out, it usually results in an unfavorable outcome (in our perspective) such as disease, pain, stress, emotional suffering, etc. What can I do to balance my life’s & body’s yin and yang you may ask? When bring an awareness into your life equipped with the knowledge of yin and yang, you can see profound health improvements. Of course to see these benefits, you also need to apply the yin-yang practice to your life. Become aware of your diet, life practices, habits, etc. Become aware of them and determine whether they are causing you to become a balanced person or lean towards yin or yang. Everything should be balanced, everything in moderation. It may not be practical to classify everything in your life as yin or yang. You still can live your life with a solid understanding and awareness of yin-yang to use it as a self-balancing tool for holistic health. For example, sit down in a quiet room after a full day and reflect on it. How much have you worked (yang) in comparison to some form of relaxation such as meditation (yin), sitting down for a breather, or yin yoga? What is the nature of your work, is it mentally or physically demanding? If so you may want to do some of the opposite to balance yourself out to balance the body and mind. Have you eaten too much of one food type such as wheat or meat? As you can see, the yin-yang approach to health can, in a way, simplify your journey to healthy living. The most difficult aspect is figuring out what is balanced. This is nothing I can personally tell you without knowing your characteristics. What you need to become balanced is going to be different than everyone else and vary moment-to-moment. The best way to acquire an awareness and intuitive knowledge about how you can achieve balance in your life for improved health is through practices that increase your consciousness and spiritual connection. Meditation, yoga, Qigong, self-reflection, or any other similar practice can nourish your self-awareness. It also helps to avoid substances that alter your mind because they cloud your awareness and judgement. Meditation alone can be intensely effective for self-awareness and balance. Check out 3 Common Ways to Meditate to learn how to meditate and The 10 Most Amazing Health Benefits of Meditation to convince you that meditation is totally worth bringing into your life. Yin and yang are always in perpetual motion in efforts to get closer to an ideal balance. This is how you should live your life to become holistically health and acquire a happy mind! 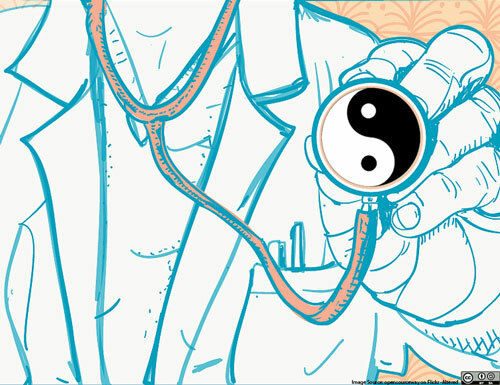 The yin-yang theory is best not obsessed over, but used as a tool to improve your overall health. The more you become aware of it and apply it to your life, the easier it will become. Seek to balance your mind, body, and diet–you will not regret it! The benefits you will receive from such a balance are limitless. Feel free to comment below with any questions, comments, or suggestions! If you are really interested in this subject, feel free to check out these amazing reads. “Healing With Whole Foods” was the book I primarily have used to educated myself about yin-yang and food in general. If you are looking for more help with holistic health and wellness or your general health goals, please check out our services page. We offer an AMAZING support program that will help you become healthier with less effort, reduce confusions you may have about healthy living (it can become quite complicated), develop goals and plans to better your health, and best of all, save you time–our most precious resource! If You Liked This Article, Please Support My New Practice By Sharing This Article or Referring People to the Services Offered (You and the referred person also get a free health consultation by doing so!). Pitchford, P. (2002). Healing with whole foods: Asian traditions and modern nutrition (3rd ed.). Berkeley, Calif.: North Atlantic Books.